Over the course of 15 years as a journalist, Javier Córdoba says he has never experienced anything like the events of Wednesday evening. As he was reporting on students from the University of Costa Rica (UCR) conducting a peaceful protest on the streets of San Pedro, he says police escalated the situation with aggression toward students. Then, the journalist says, they turned their attention to him. Córdoba says that while he was filming the scene with his phone, a police officer restrained him and hit him with a baton. The reporter says another officer was approaching with a baton until he repeatedly shouted, “I’m a journalist,” and was released. 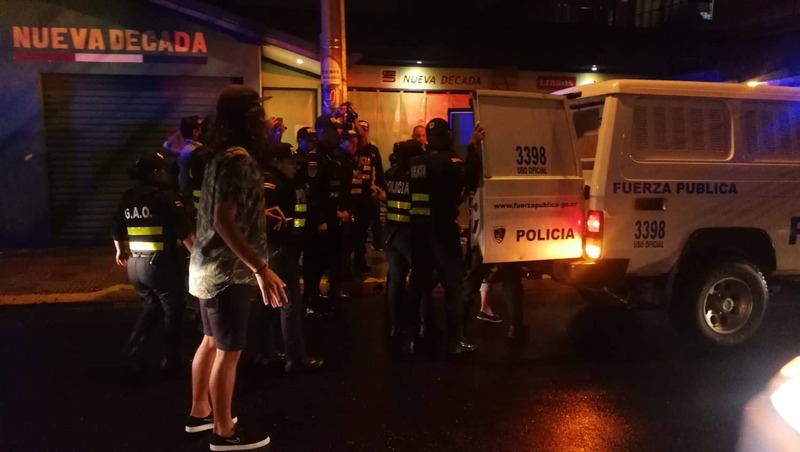 “What I found unfortunate was that it was a situation that could have been resolved peacefully — because the streets were emptying — but [the police] decided to finish it with aggression toward the students,” Córdoba said in a phone interview with The Tico Times on Thursday morning. The Tico Times contacted the National Police for comment on Thursday morning, but was told that Casa Presidencial is handling the response. President Carlos Alvarado called Córdoba’s news outlet, the weekly Semanario Universidad — which is housed on the UCR campus and is funded by the public university — to apologize on behalf of the Costa Rican government, Córdoba said. President Alvarado also tweeted that he will meet with UCR officials Thursday to analyze the situation and “strengthen the dialogue” between the university and the government. UCR students were joining thousands of citizens who have been marching in San José and across Costa Rica this week against a proposed tax reform, which they say would have an unfair impact on the working class. Those protests have generally remained peaceful, but became more confrontational Wednesday. Córdoba detailed how Wednesday’s demonstration turned violent in his conversation with The Tico Times. Córdoba explained that police began confronting students even as they were returning to their campus. “When a police officer finished hitting one of the men, he turned and saw me filming,” the reporter said. “It must have bothered him that I filmed what he was doing, so he grabbed me and started hitting me with his baton. La Fuerza Pública arremetió a golpes contra los estudiantes que bloqueaban la calle principal en San Pedro. En una acción innecesaria, ya que los estudiantes ya se habían retirado, la policía capturó y golpeó a varios de ellos. Inclusive el periodista de UNIVERSIDAD, Javier Córdoba, fue golpeado por oficiales mientras grababa la escena. Bruised, but not otherwise hurt, Córdoba returned to work Thursday as protests continued.